The Death of Ivan Ilyich by Leo Tolstoy 1886 / 62 pages (Kindle) rating 10 / Russian classic If you haven’t read this book please put it on your “to be read” list – somewhere near the top. If you have read it one time long ago, go read it again because it deserves it. I’ll only let you off the hook if you read it within the last couple years. Ivan Ilyich is dead from the start – the announcement is made on about page 2. If the book were not structured this way it would turn from a theme-driven story about how a man actually dies, to a suspense based on the question of whether Ilyich will live or not. As it is, we know he dies. The point is what he goes through before he gets there. Our focus is on Ilyich’s life and his death – his final days especially. But we get the whole outline of his life starting in Chapter 2. Ilyich has lived a normal bourgeois life, “most simple and most ordinary and therefore most terrible” (page 2) basically interested in his own petty desires for prestige amongst his fellows – ambitious and social climbing and just like those around him. It was more stressful after he married and supposedly settled – Ivan never seems to have developed any close relationships, certainly not with the members of his family or Peter, his closest colleague. The selfishness of this bunch is not a gross selfishness, just a human “me and my needs first” kind of self-centeredness which incorporates the seven deadlies, pride, anger, greed, gluttony, lust, envy and sloth – fear sometimes and a lot of deceit, but not to the point they are directly ruinous – only to the point it will get them what they want. At some point Ilyich hurts his side and from that time he has health issues which increase. He’s not an old man – (although in 19th century Russia mid-40s is certainly not young). The health problem is said to be related to his appendix. It proves fatal but not without enormous pain and suffering to Ilyich and his family as well as friends. Only the kind peasant, the butler’s assistant Gerasim, can help him. Now he starts to see the enormity of deceit in the lives of those around him as they lie to him, to each other, and to themselves. 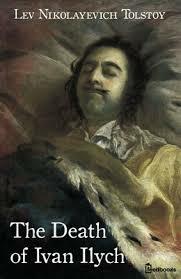 At the very end of the book, as he’s dying … well… let’s not go there – read it! The history is interesting as Tolstoy placed the setting very specifically in the 1880s by referring to the court reforms of Alexander I and to Sarah Bernhardt. This means he was putting the issues squarely in the face of his contemporary readers – not hiding them in historical fiction or allegory. The Death of Ivan Ilyich was written after Tolstoy’s conversion in the 1870s so there is nothing of the War and Peace, Anna Karenina, Cossacks romance (in the large sense) to them – what Tolstoy later called the products of his vanity. The Death of Ivan Ilyich and the other works of this time frame are morality plays of a sort – they are about the meaning of life and how to live the worthwhile or righteous life. Finally, it was interesting to refresh my reading of Chapter 1 after I finished the book – sad and both a continuation as well as cyclical on several levels.